This interdisciplinary collection by historians, cultural critics and literary scholars examines a variety of the political, social, and cultural forces at work during the English Renaissance and beyond, forces that contributed to creating a wealth of artistic, literary and historical impressions of Elizabeth, her court, and the time period named after her, the Elizabethan age. Articles in the collection discuss Elizabeths' relationships, investigate the advice given her, explore connections between her court and the arts, and consider the role of Elizabeth's court in the political life of the nation. Some of the ways Elizabeth was understood and represented demonstrate society's fears and ambivalence about early modern women in power, while others celebrate her successes as England's first and only unmarried queen regnant. This volume will be of interest to scholars and students in a wide range of disciplines, including literary, cultural, historical and women's studies, as well as those interested in the life and times of Elizabeth I. 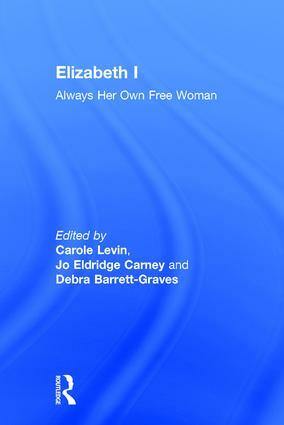 Contents: Introduction, Carole Levin, Jo Eldridge Carney and Debra Barrett-Graves; Elizabeth and a Problematic Court; Queen and Country? : Female monarchs and feminized nations in Elizabethan political pamphlets, Jacqueline Vanhoutte; Robert Sidney, the Dudleys, and Queen Elizabeth, Michael G. Brennan, Noel J. Kinnamon, and Margaret P. Hannay; 'Highly touched in honour': Elizabeth I and the AlenÃ§on controversy, Debra Barrett-Graves; Elizabeth Moves Through her Kingdom: Religious conformity and the progresses of Elizabeth I, Mary Hill Cole; Turning learned authority into Royal supremacy: Elizabeth I's learned persona and her university orations, Linda Shenk; The Fairy Queen figure in Elizabethan entertainments, Matthew Woodcock; Looking at Elizabeth through Another Lens: 'A poore shepherde and his sling': A biblical model for a Renaissance queen, Michele Osherow ; 'Ceste Nouvelle Papesse': Elizabeth I and the specter of Pope Joan, Craig Rustici ; Queen to queen at Check: Grace O'Malley, Elizabeth Tudor, and the discourse of majesty in the state papers of Ireland, Brandie R. Siegfried; Elizabeth Then and Now: Elizabeth and the politics of Elizabethan courtship, Ilona Bell; Popular perceptions of Elizabeth, Sara Mendelson; Young Elizabeth in peril: from 17th-century drama to modern day movies, Carole Levin and Jo Eldridge Carney; Afterword, Janel Mueller; Bibliography; Index.